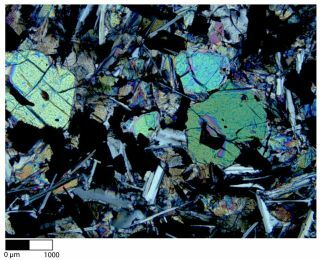 A thin section of an Apollo moon rock showing unshocked olivine and plagioclase. The moon may have possessed a magnetic field for much longer than previously thought, one that was also much stronger than scientists had predicted, a new study finds. Earth's magnetic field is created by its dynamo, its roiling molten metal core. Scientists have long suspected that the moon once had a dynamo as well, since evidence of magnetism was found in rocks brought back from the moon by Apollo astronauts. But, meteoroids colliding with the moon could have created plasma, which could in turn have generated magnetic fields. To see if a dynamo or meteoroids might be responsible for magnetism on the moon, researchers wanted to examine rocks that had not been influenced by cosmic impacts. Now an analysis of lunar volcanic rock returned from the Apollo 11 mission suggests the moon did indeed possess a powerful dynamo in its core 3.7 billion years ago. "The findings in general were a big surprise," said study lead author Erin Shea, a geologist at the Massachusetts Institute of Technology. "When we selected this sample, we had an idea that it'd have a good magnetic record, but we didn't have an idea how good it would be." "The implications are amazing and interesting," Shea told SPACE.com. "If the moon had a dynamo that lived a long time, why not an asteroid like Vesta or a smaller asteroid?" It remains unclear, however, what might have powered this ancient lunar magnetic field, the researchers added. Scientists had thought that any lunar dynamo that might have once existed was generated much the same way as it is on Earth — by the cooling of its interior, which would caused the moon's core to churn as molten metal cooled and sank. However, if the lunar dynamo lasted at least 500 million years, as the current findings suggest, researchers now have to find alternative power sources to explain such a long-lived effect — perhaps impacts from large asteroids, or shifts in the moon's axis of spin. "If the moon's dynamo had the same power source as Earth, it would have died off a really long time ago," Shea said. "Now we want to see how long it did last, by looking at lunar samples from existing collections and, hopefully, fingers crossed, by going back to the moon. We'd want to see if the moon had a steady-state dynamo, one that lasted the entirety of the 500 million years, or if it maybe started up and then turned off and then turned on again." The scientists detailed their findings in the Jan. 27 issue of the journal Science.